A walking cane is useful if you have a weak or injured leg or if you have minor balance difficulties. Improper use of a cane can set you off-balance. Using a cane properly makes walking safer and less painful. Set the height of your cane if you have an adjustable model. When you stand the cane up directly next to your body, the top of the cane should be level with your wrist. Grasp the grip of the cane with the hand that is on the opposite side of your injured or weak leg. To properly grasp the grip, your thumb should be facing your body and the back of your hand should be facing away from you. Swing the cane forward as you simultaneously step forward with your opposing leg. Both the cane and your foot should touch the ground at the same time. 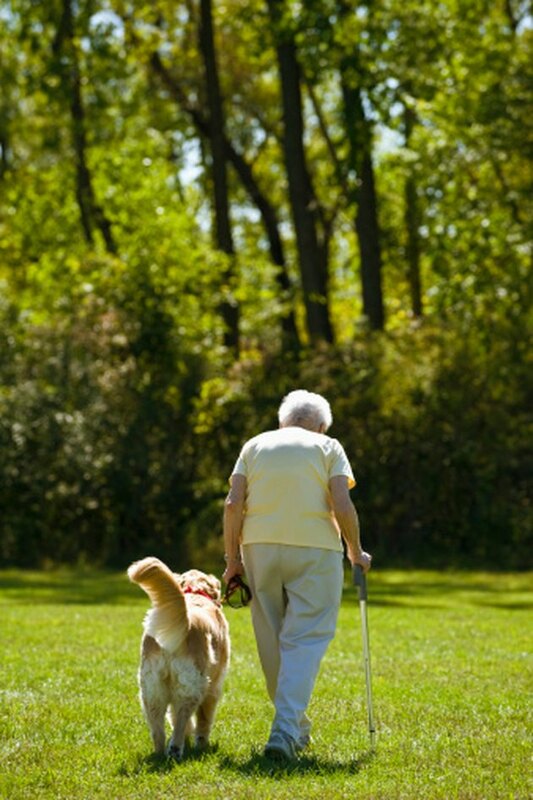 Take small steps as the cane and your leg work together in unison. Small steps help you maintain balance. Climb stairs by stepping up with your good leg first. Hold the handrail, if one is available, with the hand that is not holding the cane. Then place your cane forward onto the step, holding the cane with the hand opposite of your injured leg. Step up with your weak leg while leaning on your cane for strength and leverage. Descend stairs by placing your cane forward onto the step in front of you. The cane should be held with the hand that is opposite of the injured or weak leg. Step forward with your injured leg, leaning on the cane for strength and leverage. Then step down with your strong leg. For the best results, have your cane properly adjusted to your body height by a physical therapist. A physical therapist can also give you hands-on training and advice on using a walking cane. With practice, a cane becomes easier to use. Check the rubber tip on the bottom of your cane daily to make sure it is in good condition. A rubber tip that is worn or missing can cause you to slip and fall. Replace the rubber tip if it is missing, the tread is worn or the tip is torn.